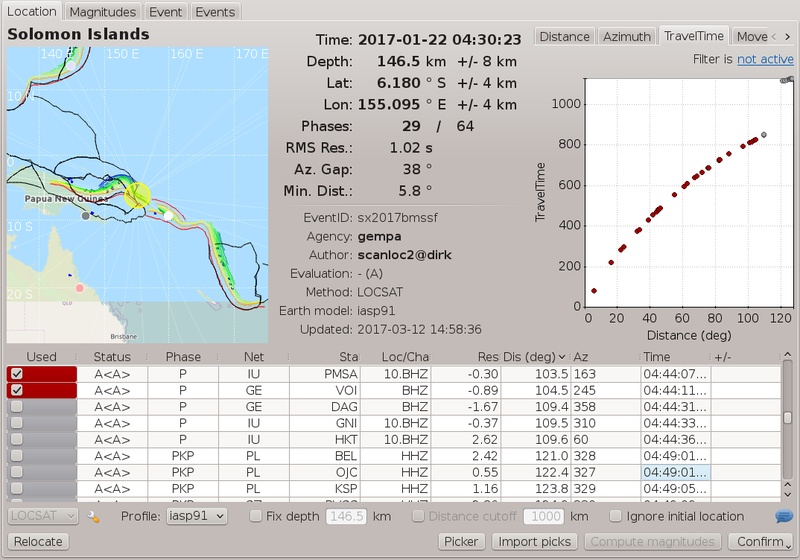 scanloc is a module to detect and to locate local and regional earthquakes using the clustersearch algorithm DBSCAN. The algorithm DBSCAN is described here. scanloc determines hypercenter solution by cluster search, but it also associates additional P and S phases to existing internal solutions or solutions incoming through the messaging system by external modules. In order to deliver high-quality picks from S phases, the scanloc packages also provides the enhanced S pickers with the graphical debugger. scanloc can also be used to suppress fake events due to large earthquakes recorded by dense local networks at teleseismic distances. A dedicated section explains the setup. playback_picks: play back picks with amplitudes at normal or different speed and send them to the messaging systen. playback_picks supports multiple pipelines. For these tools, the usual options (-h, --debug, etc.) apply. See the section Examples below for their applications. The entry point of scanloc is the addObject method which handles incoming objects from the messaging system. By default it is subscribed to the messaging group PICK and LOCATION. Depending on which object type (pick or origin) is incoming different working steps are proceeded. The weight factors score.weights.p , score.weights.p0 , score.weights.s , score.weights.s0 score.weights.depth and score.weights.residual can be configured. The values for depthFactor and residualFactor are derived from considered depth and residual and the configured values for ignoreDepth and association.maxResidual. In case the pick can be associated, the scores for all new origins are calculated and the origin with the highest score is selected. scanloc internally associates origins to events and only if the score of the new origin exceeds the score of the last sent origin, the new origin is send out. In case the pick cannot be associated, the cluster search is started. The cluster search is based on the algorithm DBSCAN which takes the required number of neighbours (clusterSearch.minSize) and clusterSearch.maxSearchDist as configuration parameters. where is the spatial distance between the stations in units of km and is the clusterSearch.averageVelocity in units of km/s. Therefore and clusterSearch.maxSearchDist take units of seconds. As the cluster search is done over time and location, the additional configurable velocity parameter, clusterSearch.averageVelocity, is required to transform the input parameters of the cluster search in the same dimension (time). The velocity should represent the average apparent horizontal P-wave velocity of the crust. Within one cluster, the difference in the pick times between the cluster reference time and any other pick must not exceed clusterSearch.maxPickDelay. Otherwise the pick is rejected from clustering. The parameter clusterSearch.maxPickDelay has a big impact on the performance of the cluster search. Choosing the parameter as small as possible will speed up scanloc and will reduce the complexity of the cluster search. # Maximum allowed difference between P pick and cluster reference time(latest pick time). # regardless of the delay. Unit: seconds. Then, only external origins can be considered for phase association. The cluster search can be constraint to stations within a region given by the coordinate of a central point and the radius around that point. The region constraint is configured through clusterSearch.regionFilter. Applying this parameter will disregard picks from stations outside the region for cluster search increasing the speed and the complexity. Nevertheless, the excluded picks are available for phase association. For running the cluster search in several regions in parallel, different instances of scanloc taking picks from the same of different pickers can be created and started. Use the option cluster-search-log-file to store detailed information on the clustering process in a file, e.g. cluster.log. The given values can be used to optimize the cluster search parameters. The summary value can be used as a lower proxy to set clusterSearch.maxPickDelay. When a cluster of P picks meeting association.minScore is found scanloc locates the cluster, creates an internal origin and associates additional picks from P and S waves which are buffered by scanloc. The time the picks and the origins and are kept in the buffer by scanloc is controlled by buffer.pickKeep and buffer.originKeep, respectively. The new set of picks are used for relocating. In case the buffered pick is a P pick the algorithm directly attempts to associate the pick based on the residual. It tries to relocate the solution after each successful association. P picks with travel-time residuals larger than association.maxResidual are rejected. After the P-picks are associated and relocated, scanloc tries to associate the S picks. This association is not based on the residual but on the P pick referenced by the S pick. The S pick is only associated in case the corresponding P pick is already associated to the origin. Also after each S pick a relocation is done. In case the relocation fails or the event residual is larger than maxRMS, the S pick is associated with a weight of 0. The score of the resulting origin is compared with scores of origins belonging to the same event. In case the score is higher than the rest of the origins, the origin is send out. In addition to origins from the cluster search, scanloc can also treat external origins that are created by other associators, e.g. scautoloc. In case an such origin is received scanloc tries to associate all picks in the buffer to the origin. The association and the following processes are the same as described above. See figure Simplified work flow. for an overview. 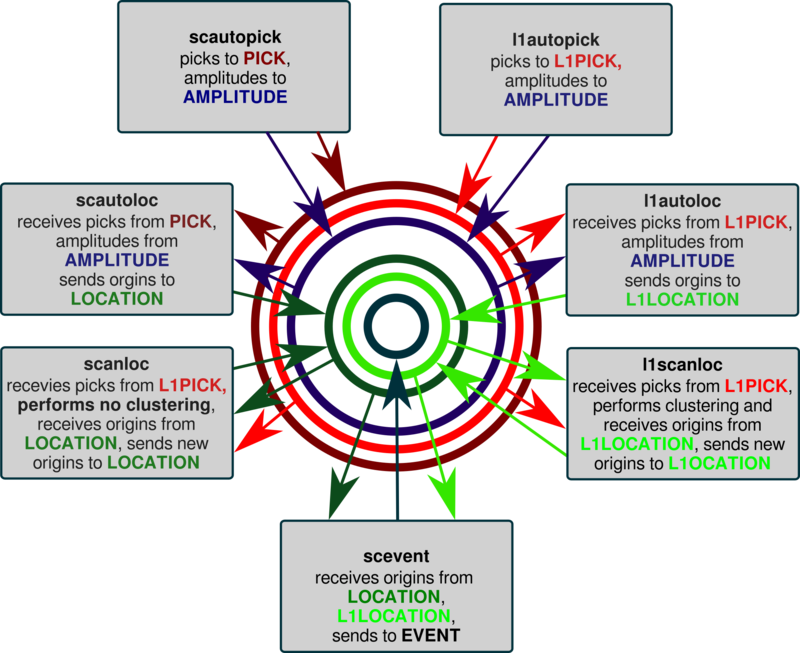 Only picks from stations within a maximum epicentral distance range are considered. The maximum expicentral distance is configured for all stations by association.maxDist. However, this parameter can be overruled per network and station by providing a station table in a file. The file name is configured by association.stationConfig. As in scautoloc each line of the table consists of the network code, the station code, a switch and the maximum epicentral distance in degrees. Wildcards can be used for the network and the station code. The switch causes the associator to consider (=1) or to ignore (=0) a network or a station. The last occurrence of an item in a table overrules previous ones, e.g. # Type of traveltime tables for phase association. May be different from locator. # Use e.g. libtau or LOCSAT. Typically, LocSAT is used as it is a fast locator. Alternative locators, e.g. Hypo71 can be choosen but speed should be considered. The respective plugin must be loaded in scanloc and the considered profile must be configured in the global configuration. Traveltime tables used during association and location may be different. Therefore the traveltime residuals visible after relocating may be different from the traveltime residuals considered during association. The differences must be considered when configuring association.maxResidual. Note: Computational speed can be an issue when alternative locators are used and when many picks are to be tested during association. In this case scanloc can be configured with LocSAT but screloc may be used along with the preferred locator and profile to relocate the origin. The locator NonLinLoc is certainly too slow for being used in scanloc but is a good option for screloc. scanloc forms internal origins from the locations and the picks. Internal scanloc events are formed from these origins based on the eventAssociation. * parameters. Dense local networks used to monitor local seismicity are often able to catch also a significant number of phases from earthquakes at teleseismic distances. Such phases include Pdiff or PKP. Especially PKP may contain a significant amount of energy at higher frequencies. Therefore PKP is often detected by networks that are tuned to detect local earthquakes. Due to the steep incidence and the low horizontal slowness of these phases, they are sometimes located as fake deep earthquakes below the network. scanloc can be used to suppress this type of fake events. In a 2-pipeline setup, scanloc can associcate such teleseismic phases recorded by the local network with origins that were found by the pipeline for monitoring teleseismic earthquakes. Then scevent will associate the origins from the teleseismic pipeline with the fake origins from the pipeline for local monitoring to the same event. The assumption is that the origins from the teleseismic pipeline win over the origins from pipeline for local monitoring because they have more associated arrivals. In this case the origins from pipeline for teleseismic monitoring that has most phases becomes the preferred origin for the event. This scanloc feature requires an extended license. Pipeline 1 monitors local earthquakes using scautopick, scautoloc, scanloc and default message groups. Pipeline 2 monitors teleseismic earthquakes using scautopick2, scautoloc2 and scanloc2 using the message groups PICK2 and LOCATION2. Let scanloc2 not perform cluster search (clusterSearch.maxOrigins = 0) but allow scanloc2 to only associate P picks from pipelines 1 based on origins from scautoloc2 (connection.subscriptions = "LOCATION2, PICK" in the global module parameters). Configure scanloc2 to associate the picks from pipeline 1 as picks with zero weight when they are, e.g., in the PKP or Pdiff distance range. Use one zeroWeight profiles per phase. In order to facilitate association of teleseismic picks, the picks and the origins must be kept in memory for sufficient time. Increase buffer.pickKeep and buffer.originKeep accordingly, e.g. to 1800 s.
In this way zero-weight picks will not be used for locating the event but are part of the origin and can be considered by scevent. Configure scevent to listen to the message groups from both pipelines (e.g. LOCATION and LOCATION2) and activate the scevent module parameter eventAssociatoin.allowLooseAssociatedArrivals. Parameter exchange in a 2-pipeline system. The messaging system, responsible for the parameter exchange, is representated by the circles, indicating the message groups. Local monitoring is configured with scautopick, scanloc, scautoloc, teleseismic monitoring with scautopick2, scanloc2, scautoloc2. Location tab in scolv with zero-weight picks associated by scanloc2 as PKP phases. 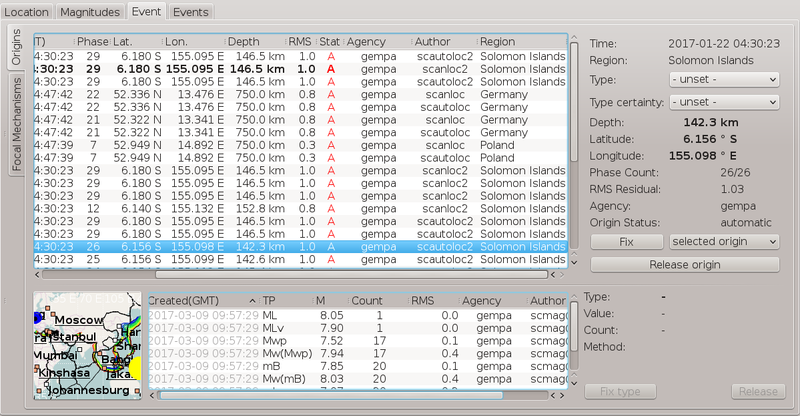 Event tab in scolv showing the origins from the pipelines for local and teleseseismic monitoring. The preferred origin located near the Solomon Islands is shown in bold on top. Fake origins in Europe located by pipeline for local monitoring based on PKP phases falsely considerded P phases are associated to the event but do not form the preferred origin at any time. 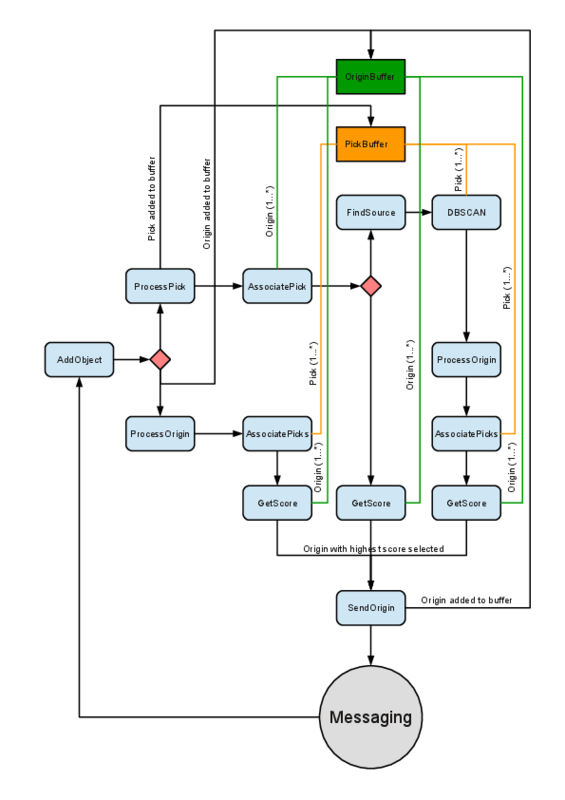 The best origin from internal scanloc events meeting the parameters ignoreDepth, maxRMS and minScore are sent to the SeisComP3 messaging or to stdout in case of XML playbacks (--ep). The scanloc modul contains the enhanced S picker S-AIC and S-AIC-V as well as the debugger. The scanloc package includes two S pickers: S-AIC and S-AIC-V enhancing the performance of the picker with respect to the OpenSource S-L2. Both picker apply an AIC algorithm in order to detect S phases after a P pick was maked. Therefore S phases are only detected after a P detection. Using the S-AIC, S picks are determined on the vectorial sum of the horizontal componentes (L2 trace). The S-AIC-V works like the S-AIC but it picks S phases on the vertical component. The performance of the pickers have been tested by comparison of automatic with manual picks (see the Figure showing the comparison). Performance comparison showing the differences in pick time from manual picks and the optimally tuned pickers S-L2, S-AIC and S-AIC-V for local earthquakes in West-Bohemia/Vogtland. The area is typical of local earthquake monitored at short epicentral distances of a few tens of kilometers. The distribution of the differences in the automatic pick times with respect to the manual ones shows the increased performance using the S-AIC. Add the plugin saic to the configuration of scautopick for making use of the S-AIC or the S-AIC-V.
Activate one of the pickers (S-L2, S-AIC, S-AIC-V) by changing the name of the S picker in the module configuration of scautopick. Configure the picker in the profile bindings of scautopick. noiseBegin Data window added before the p pick on order to compensate for effects due to the data processing, filtering. signalBegin Start of the data processing relative to the reference P pick. signalEnd End of the data processing relative to the reference P pick. filter Filter applied before forming the L2 trace. Not used by S-AIC-V.
detectFilter Filter applied on the L2 trace before AIC analysis. step Step size in which the time windows are enlarged. minSNR Minimum SNR in order to accept a pick. minCnt Minimum number the AIC minimum must be found for subsequent time windows. uncertainty Pick uncertainty. Unused by the picker but part of the pick element. Add the plugin spickdbg to the configuration of scolv. Configure the initial parameters in the global bindings of the considered stream. The debugger GUI can be started from the picker window of scolv. If there is an existing P pick the debugger window can be opened with a right click on the P pick. In the dropdown menu the S picker type can be chosen. A new pop-up window opens where the P pick (red line) and the newly determined S pick (light blue line) are shown. The initial paramters can be changed to find the optimum values. They are defined in the global binding profile assigned to the considered stream. To test the changed settings click on the Update button. In order to make use of the tested parameters their values must be added to the bindings profile of scautopick. 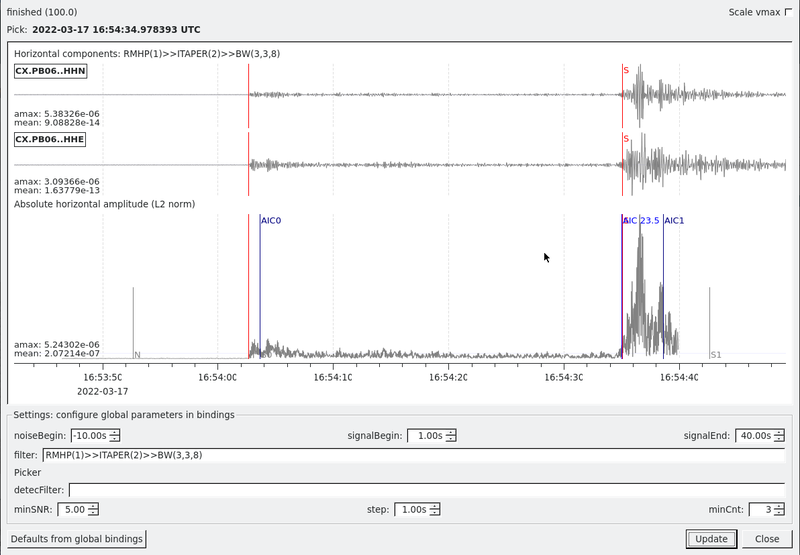 The example shows the debugger GUI for a local earthquake in West Bohemia/Vogtland. The red line represents the time of the reference P pick. The light blue line shows the final S pick (the number indicates the SNR). S-picker debugger example showing the filtered horizontal traces and the resulting L2 trace. Pick Pick time based on current parameter values. AIC0 Start of the data processing relative to the reference P pick. AIC S pick based on the considered parameters with number indicating the SNR. AIC1 End of the data processing when meeting MinSNR and MinCnt. Playback of picks stored in XML format to locate events and to determined the magnitude. Intermediate results are stored in XML files. Events may exist in the database and shall be updated with new origins new events based on new origins shall be added. Run the messaging system and all modules that shall process the new parameters of the origin, e.g. scamp, scmag, scevent. Use scdispatch to send the new objects to the messaging system. Instead of the origins, other parameters created by the proceedures in (1.) may be distpatched. Playback of picks stored in XML format, without a database. Initial step: store the station inventory and the configuration from a database once in a XML file. Continue with the examples above replacing the database parameter "-d host" with "--inventory-db inventory.xml --config-db config.xml". F. Grigoli, L. Scarabello, M. Boese, B. Weber, S. Wiemer, J. F. Clinton: Pick- and waveform-based techniques for real-time detection of induced seismicity, 2018, Geophys. J. Int., 213:2, doi: 0.1093/gji/ggy019. J. Clinton, F. Grigoli, T. Diehl, T. Kraft, L. Scarabello, M. Hermann, P. Kaestli, M. Boese, S. Wiemer: Advanced Real-time Monitoring for Natural and Induced seismic sequences, 2018, Geophyscial Research Abracts, EGU General Assembly, Vol. 20, abstract: EGU2018-9480-2. F. Grigoli, M. Boese, L. Scarabello, T. Diehl, B. Weber, S. Wiemer, J. F. Clinton: Picking vs Waveform based detection and location methods for induced seismicity monitoring, 2018, JpGU2018, Japan, abstract: SSS03-05. F. Grigoli, M. Boese, L. Scarabello, T. Diehl, B. Weber, S. Wiemer, J. F. Clinton: Picking vs Waveform based detection and location methods for induced seismicity monitoring, 2017, Geophyscial Research Abracts, EGU General Assembly, Vol. 19, abstract: EGU2017-10562. D. Roessler, E. Ellguth, S. Herrnkind, B. Weber, R. Henneberger, H. Blanck: Cluster-search based monitoring of local earthquakes in SeisComP3, 2016, AGU Fall Meeting, San Francisco, USA, abstract S31E-06. Default depth to use Default is 5.0. Depths larger ignoreDepth will be ignored. Default is 650.0. Origins received from messaging will be ignored. Default is false. Maximum allowed overall residual Default is 1.5. Score to be reached to send origin Default is 0.0. Number of seconds to keep picks in internal buffer Default is 180.0. Number of seconds to keep origins in internal buffer Default is 180.0. clusterSearch. * Parameters controlling the cluster search. Average velocity used for distance calculation Default is 4.0. Check, if derived origins fulfill the cluster search criteria anymore. Activating this option may lower the number of events and suppress fake events. Default is false. By default the algorithm creates a new arrival set when there is already a pick with the same stream id assigned. Use this option to ignore surrounding picks. Default is 0.0. Maximum allowed origins derived from cluster search. Set this option to zero to disable the cluster search completly. Default is 128. Maximum allowed difference between P pick and cluster reference time(latest pick time). The cluster search ignores all picks which exceed the value. Using "-1" enables all picks regardless of the delay. Unit: seconds. Default is -1.0. Maximum allowed distance for neighborhood search accounting for traveltime difference, inter-station distance and the configured averageVelocity. Units: seconds. Default is 60. Minimum allowed cluster size Default is 4. Send origins based on cluster search only as preliminary origins. Consider activating "checkOrigins". Default is false. Take only picks into account those sensor locations are inside the defined region. The region is defined by latitude, longitude and a radius in km. By default the region filter is disabled. association. * Parameters controlling the association of phases to origins. Type of traveltime tables for phase association. May be different from locator. Use e.g. libtau or LOCSAT. Default is LOCSAT. Name of traveltime table used for phase association. May be different from locator profile. Default is iasp91. Maximum allowed distance to take picks into account. Default is 1000.0. Maximum allowed residual for pick association. Default is 4.0. Score to be reached to start pick association process. Default is 4.0.
zeroWeight-profile name for associating the configured phases with zero weight to origins. Multiples profile names may be set separated by comma. The order of names determines order of checked phases. Each profile can have different parameters. association.zeroWeight. * zeroWeight profiles containing the parameters for associating phases with zero weight to origins. association.zeroWeight.$name. * $name is a placeholder for the name to be used and needs to be added to zeroWeight.profiles to become active. One phase type to be associated with zero weight. Examples: PKP or Pdiff. Minimum epicentral distance. Default is 120.0. Maximum time residual of the associated phase. Default is 5.0. This parameter is only used in conjunction with eventAssociation.maximumMatchingArrivalTimeDiff. If a station has multiple associated arrivals for a particular event, this flag defines if the time distance of a new pick to all arrivals must be within eventAssociation.maximumMatchingArrivalTimeDiff or if one matching arrival is enough. Default is false. Minimum number of matching picks between two origins to be associated to the same event. Default is 3. If this time window in seconds is negative, pickIDs are compared to find matching arrivals. A non negative value (including 0) compares pick times regardless of the pickID. Pass: |pick1.time - pick2.time| <= threshold Default is -1. Allowed location difference between an incoming origin compared with preferred origins to get associated. Default is 500.0. Associates an origin with an existing event if the origin time differs not more than 60 seconds unless the minimumMatchingArrivals criteria matches. Default is 60.0. The locator type to use Default is LOCSAT. The locator profile to use Default is iasp91. If enabled the locator fixes the depth to the configured default value "defaultDepth" in case that all previous attempts to relocate fail. This option may result in many more origins. It prevents "ignoreDepth" from beeing effective if "defaultDepth" < "ignoreDepth". Default is false. score. * Formula to calculate the internal origin score. Configurable are the weighting factors for the following components: used P-phase (score.weights.p), unused P-phase (score.weights.p0), used S-phase (score.weights.s), unused S-phase (score.weights.0), depth (score.weights.depth) and residual (score.weights.residual). Defines the weight of p arrivals for scoring Default is 1.0. Defines the weight of p arrivals with a weight of zero for scoring Default is 0.4. Defines the weight of s arrivals for scoring Default is 2.0. Defines the weight of s arrivals with a weight of zero for scoring Default is 0.5. Defines the weight of the depth for scoring Default is 1.0. Defines the weight of the residual for scoring Default is 1.0. Parameter "a" in the equation t = aN + b. t is the time interval between sending updates of an origin. N is the arrival count of the origin. With option --ep (playback mode) the value is automatically set to 0. Default is 0.5. Parameter "b" in the equation t = aN + b. t is the time interval between sending updates of an origin. N is the arrival count of the origin. With option --ep (playback mode) the value is automatically set to 0. Default is 0.0. Use alternative configuration file. When this option is used the loading of all stages is disabled. Only the given configuration file is parsed and used. To use another name for the configuration create a symbolic link of the application or copy it, eg scautopick -> scautopick2. Run as daemon. This means the application will fork itself and doesn't need to be started with &. For each log entry print the component right after the log level. By default the component output is enabled for file output but disabled for console output. Limits the logging to a certain component. This option can be given more than once. Use syslog logging back end. The output usually goes to /var/lib/messages. Send log output to stdout. Output detailed cluster search information to a file. A group to subscribe to. This option can be given more than once. Sets sending of a start- and a stop message. List all supported database drivers. The database connection string, format: service://user:pwd@host/database. "service" is the name of the database driver which can be queried with "--db-driver-list". Release <> version 2019.92 © Copyright 2015, gempa GmbH.